For your dearest people, order online this Mesmerizing Rakhi with Puja Thali and 100 gm. 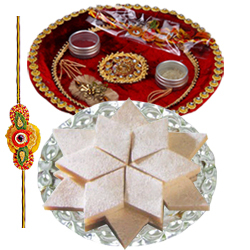 Badam Katli to offer the best Raksha Bandhan they have ever celebrated in their life. A slight variation in design may take place.